A basic principle in working with a sourdough starter – no wait, make that ‘living with a sourdough starter’, – is not to be in a hurry. This relaxed attitude carries through to maintaining the starter, and to the proving of the doughs once the starter is put to work. This sourdough starter takes about two weeks to establish initially, but those two weeks are going to pass anyway, so let them be productive. And after that it just keeps improving as it matures – as do we. In starters, it is proportions that are important. I tend to the exact, and I like definite measures. This particular recipe uses one formula – there are others around. Once the starter is established, the flour/water ratios used in each recipe can be adjusted. 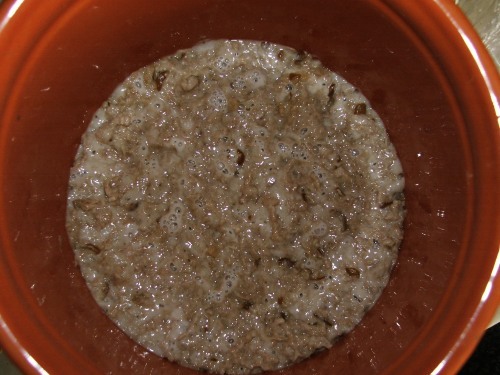 Starting a Sourdough Starter – How I did it. My starter is now about 5 years old. It was born in the high sierras of Tarragona, from the finest wild yeast that flourished in the clear mountain air. Fed on fresh-ground flour, direct from the mills, it was healthy and strong from the first day. – OK, I won’t claim that it also writes poetry . ..
º It is strongly recommended – and of course desirable to all eco-geeks such as I – that the starter be started with a flour that is as close to natural as possible. º include the peel, exclude the core. º I like the organic ‘feel’ of the apple as a component, and it makes a difference in moisture. º Of course, the eco-ideal is pristine liquid drawn from a glittering mountain stream, as it poetically burbles across a landscape unsullied by man. Realistically, not many of us have access to such a source. º Second prize then goes to a simple bottled water, and running close to that is ye olde tappe water. Go with the measurements and the ideals as much as possible. Beyond that – well, just keep smiling because I have found this starter and the doughs I have produced to be quite lenient. Each recipe has its own comments on discoveries made on the spot. º Mix the ingredients together to form a moist batter. º Put this dough-batter into a container that can be closed. I choose to work with natural containers of pottery or glass; and to use wooden utensils, but that is me. º Close the container, and leave it in a neutral spot – out of sunlight and drafts. º Leave the starter alone. OK, you can look inside. You may well see some gentle bubbling, and smell an aroma that is pleasant – slightly ‘warm fruity’, but not particularly ‘yeasty’. Don’t expect to see volcanic activity, tho’, this is the establishing phase. ⥥ ⥥ This is the apple starter on day 3, with some signs of activity. On the fifth day, weigh the batter and discard half of it. Mix in 100g flour and 50 ml water, and place the dough-batter back in the closed container. Leave it alone, this time for three days. Watch to see if it is beginning to form a more bubbly mixture. Don’t worry if it isn’t, just stay patient. A glass container is a good friend here – you can look at the whole mix for progress. One week gone, one to go. º add 100g flour and 50 ml water. These fresh additions of flour are what is starting to feed the starter. At the end of week two the starter is ready to work. A starter needs regular care, but it is not difficult to settle into a routine that fits neatly with a bread-making cycle. More on that in the first recipe – Basic Sourdough Bread.